The photographs and video images of armored vehicles and billowing tear gas, of explosions, of officers donning gas masks and armed with assault rifles made Ferguson, Mo., look like a battleground. “This is America, not a war zone,” US Senator Elizabeth Warren said in a tweet, echoing concerns of public officials and civil rights groups from across the country. The level of firepower that law enforcement officials demonstrated over the last week in response to the protests in Missouri has become a growing concern of civil rights groups, which see it as the militarization of local law enforcement agencies that are supposed to build community partnerships. “It is similar to what we’re seeing nationwide, that there is an increased militarization of our state and local police officers, in terms of the tactics they’re using and the equipment they’re using,” said Jessie Rossman, a staff attorney with the American Civil Liberties Union of Massachusetts. Hundreds of people have stormed the streets of Missouri to protest the questionable police shooting of an unarmed black teenager, and police said they had to quell violent rioting and looting at the onset, but the deployment of military-style equipment has reignited the debate over the arming of state and local police departments. The event followed a rally Thursday in memory of Michael Brown. Local law enforcement officials can obtain surplus military equipment from the Department of Defense, or can seek grants from the Department of Homeland Security and Department of Justice, among other agencies, to purchase equipment. Massachusetts State Police Colonel Timothy Alben defended the use of federal programs that transfer surplus military equipment to local departments. He said he could not comment on the police action in Missouri, but said State Police have had access to critical military equipment, such as specialized all-terrain vehicles, for use in search and rescue operations and during natural disasters. Civil rights groups argue that local departments have increasingly obtained specialized military equipment for use in day-to-day, localized law enforcement operations such as community policing and in drug arrests. And, the weapons have become more available under terrorism responses since the Sept. 11, 2001, terrorist attacks. Rossman said many local communities aren’t even aware of some of the weaponry their departments are obtaining because there is never any public input period. “I think what we’re seeing is that communities are outraged when they realize they don’t know what’s being done with their tax dollars,” she said. In Massachusetts alone, 82 police departments and other law enforcement agencies between 1994 and 2009 received more than 1,000 weapons from the Department of Defense, including 486 fully automatic M-16 machine guns and 546 semiautomatic M-14s, according to an ACLU state study released in June. The report, “Our Homes Are Not Battlefields: Reversing the Militarization and Federalization of Local Police in Massachusetts,” recommends several reforms, such as better oversight in the deployment of certain equipment. The study found that while the State Police received the most weapons, small, suburban communities such as Wellfleet and Duxbury also obtained machine guns. The town of West Springfield, with a population of just over 28,000 people, received two grenade launchers from the Department of Defense, according to the report. And police departments received “peacekeeper armored vehicles,” hundreds of other military-style vehicles, and large marine craft. The Metro Law Enforcement Council, a regional SWAT team from the Boston area, maintains its own BearCat armored vehicle, which it used in drug arrests. The agency also applied to the Federal Aviation Administration for a drone license. The report also documents the application of military-style policing in a neighborhood in Springfield and the militarization of SWAT teams in drug raids, with flash-bang grenades and battering rams. In one tragic example, a heavily armed police officer fatally shot 68-year-old Eurie Stamps, a grandfather, during a drug raid in Framingham in 2011. Stamps was not the target of the raid, and the officer accidentally shot him while subduing him. The local police chief later disbanded the SWAT team; a review showed that the team lacked certain training. He also noted the prevalence of high-powered assault rifles and shotguns that police encounter on an increasingly routine basis demonstrates the need for the specialized police raids. Alben agreed with the need for regular, updated training for the use of the specialized equipment but pointed out that departments participate in regional teams, such as the Metro Law Enforcement Council. He said each department should be able to determine its own needs but would not say whether small departments have the need for equipment like tear gas. The Amherst Police Department was criticized last year for the use of tear gas to disrupt college student celebrations after the Red Sox World Series victory. 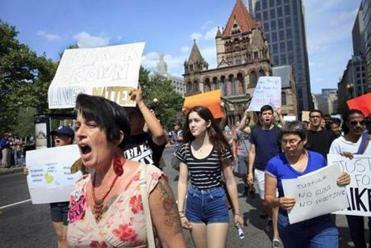 John Collins, general counsel for the Massachusetts Chiefs of Police Association, said he could not comment on how police in Missouri handled the protests, but defended the deployment of specialized equipment when needed.